Inspired by John Lennon’s controversial love for Yoko Ono, Rock & Roll’s Greatest Lovers tells the Romeo and Juliet story of two rebels from opposite ends of the world who stood together in the name of love only to face every kind of hate possible. Though fraught with challenges and tribulations, their message of peace and love is more relevant today than it was the day they shocked the world by appearing naked on the cover of Rolling Stone Magazine. It is the story of a love that changed the world and defined an era, featuring original music by Anzu Lawson and Joerg Stoeffel, book & lyrics by Anzu Lawson, and directed by Nell Teare. 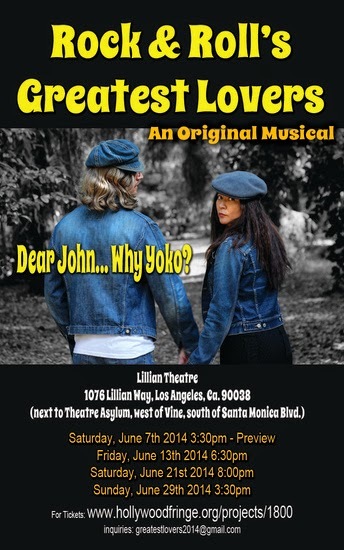 Cast member Erin Muir (who plays Cynthia Lennon) says, “The musical originated in our acting studio, the Jocelyn Jones Studio, during which Anzu Lawson, the composer, did a photo exercise as Yoko Ono. We developed it over the course of two years and this is our first full production, outside of pieces and scenes presented in the studio. We love the high energy experience of the Fringe Festival and wanted our show to be part of this theater fever frenzy. No one has ever done a project from Yoko’s point of view…that we know of. There was so much anger and hatred toward her, but all she (and she and John together as a couple) wanted for the world, was peace. When all the musicians in India got together to protest the violence against women, it was ‘Imagine’ they played on their guitars. Some of the most important parts of John Lennon’s legacy have gotten lost in the frustration and anger of our times, and this project looks to remind the audience that LOVE was what John and Yoko stood for as a couple. And then again, Yoko Ono was, well…a little weird! Look for plenty of fascinatingly mad ideas in the show as well.